A fancy organic, free-range pheasant hooks up with a 99 cent package of ramen noodles for this simple and delicious soy-based soup. Fried pheasant replaces the boring old chicken you’re tired of, while the ramen noodles and eggs keep the soup easy and familiar. 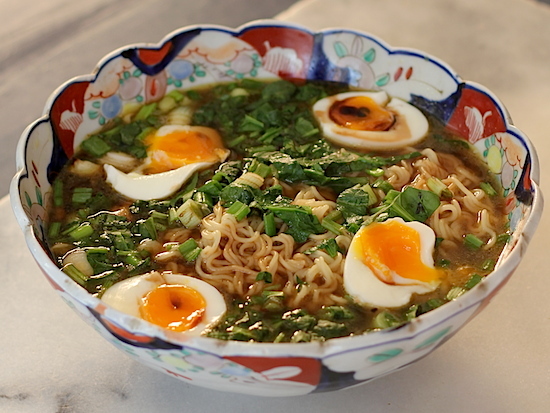 It’s even better than your favorite restaurant’s ramen and you can make it for dirt cheap. • Enough chicken broth to fill a medium sized pot (roughly two 900 ml cartons), 1 onion quartered, 1 leek cut into lengths to fit into pot, 2 cubes organic chicken bouillon, 2 lbs pork neck bones. The pork goes well with poultry and they routinely blend these flavours in Japanese cooking. Prepare the stock the night before and the rest is easy. Make as much stock as you like but you will only need about 3 cups stock for this soup. Save the rest in the fridge for another day but use it soon. It also makes a nice gravy liquid or have it heated right out of a cup for a comforting drink. • Heat the sesame oil and butter in a skillet over medium heat while heating the soup stock over another burner. • Cut the breast into thin slices and fry over medium heat in the heated oil mixture. • Add thinly sliced cabbage and fry with the pheasant until mixture is brown and starting to caramelize. You can also fry in 2 cloves crushed garlic as a nice option. • Boil noodles separately in a small pot with just enough water to immerse them. Make sure the water is boiling before you add noodles. Throw away the flavour packets that come with the noodles. They’re full of chemicals anyway. Add ½ tsp of baking soda and allow the noodles to cook according to directions on package (usually 3-4 mins). • Soft boil 2 eggs, slice the green onions and baby spinach (or miner’s lettuce, if you have it). To serve place hot stock in serving bowl, add drained noodles, pour the pheasant/cabbage mixture over the noodles and top with green onions and spinach. Finally, cut the soft-boiled eggs into halves and place in the bowl with yolk side up, allowing the yolk to drip wherever the heck it wants to. If all else fails, dig the noodle flavouring packets out of the garbage and go back to your old way of life.